Timo Weiland – I could not be “MO” proud! I would like to brag a little bit on a friend of mine, Timo Weiland. 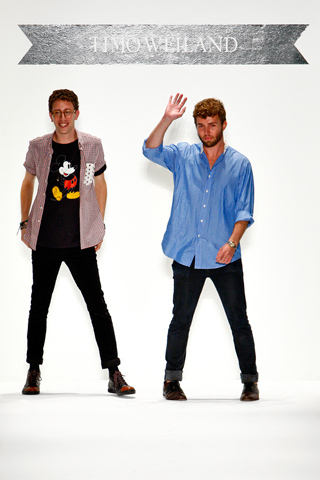 He and his business partner, Alan Eckstein had their very first runway show in Lincoln Center. What an amazing achievement! They have been showing presentation style for several seasons – but they decided to step up their game this fashion week – and they did it with a bang! I love the idea of a romper with a matching jacket - it's a jumpsuit squared. Get it? (Jumpsuit suit). I know...pretty lame pun, but sometimes I just can't help myself. And - the necklace is a must! Timo's styling of this look is a little sportier than I tend to wear - but I really like the two separates. I would probably girly it up a bit with a bunch bangles and a big blonde hairdo! I personally don't have the tummy for this one - but for anyone who does...this should be on your Spring 2012 wish list. This color is so on trend. Seen on almost every runway. I think this particular dress can be very versatile. If worn with simple accessories and classic peep toes, it could read ladylike and girly - but if styled with other colors in the neon family, it could create an edgy/fun vibe. Throw a cardigan on with it for a luncheon or a cropped leather jacket and booties for a night on the town. Seriously, Timo…I could not be “MO” proud.